The foam may not harden and will be sticky. The foam may "drip off" the roof. The foam may harden but will be brittle and too dark in colour. One of the tanks may empty before the other. The foam may not expand fully if the temperature is below the given range. The temperature must be in the range of 24 to 30 deg° C (75-86 farenheit). We provide strip thermometers for this purpose (they are not for the fish tank – the goldfish will inevitably have cost you less than the foam!). The foam starts to harden the moment the two components are mixed (this occurs in the nozzle). If you stop spraying, you must clean the nozzle immediately (not after that cup of tea! ), or alternatively replace it with a clean nozzle when you commence spraying again. If you stop spraying, the nozzles is unusable after 30 seconds, therefore the need to clean it or change it. Should a blockage occur in the gun or hoses, you will need to replace the gun/hose assembly as there are no user-serviceable parts. 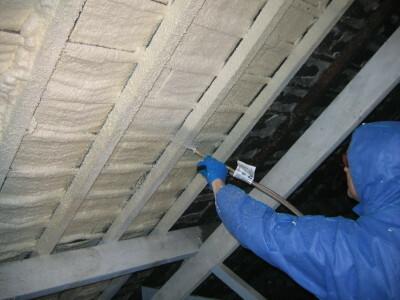 When spraying, the colour of the foam should be rich cream in colour. This tells you that the A and B components are being used in the correct ratio. If the colour changes to bright white, yellow, brown or any other colour, it means that you either have a blockage or that the spraying temperature is incorrect. If this occurs, stop spraying and check the points above. 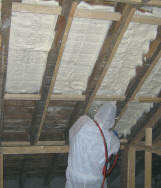 In all cases problems occur by spraying at the incorrect temperature or through a blockage. Either way, the result is money wasted so make certain you strictly adhere to the instructions provided with the kits. Low foam yield will result if the tanks are not at the correct temperature or are not shaken before use. Shaking the tanks ensures good mixing of the chemicals in the tanks. 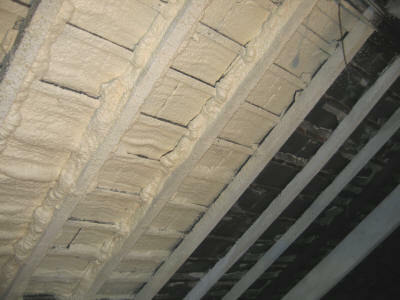 You wouldn't try spray painting before shaking the can; the same applies to spray foam. Overspray can also lower the foam yield.